Alice Brennan is going to marry a millionaire, Innes Whitlock, and they are on an excursion with the chauffer when the car breaks down in the town of Ogaunee, Michigan… Innes’ hometown. And so Innes decides that there’s no way out of it: he’ll have to visit his sisters. Known collectively as the Whitlock girls, they are three repulsive creatures all disabled in their own unique way. Gertrude is blind. Maud is deaf. And Isabel is missing her right arm. Innes lets his sisters know that he intends to marry Alice… and then the accidents begin to happen. A lamp crashes down from an upstairs table and nearly hits Innes over the head. A detour sign is removed from the road and causes a car accident. Someone messes around with the gas… Alarmed, Innes summons his lawyer and Alice summons her old history professor, MacDougal Duff. Will they get there in time? Will the sisters accomplish their murderous goal? And who on earth is the mysterious Mr. Johnson, who seems to be doing some work around the house? 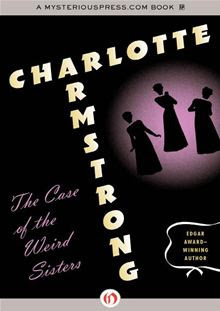 That’s what happens in Charlotte Armstrong’s The Case of the Weird Sisters, a classic mystery in which all the necessary clues are given to the reader. 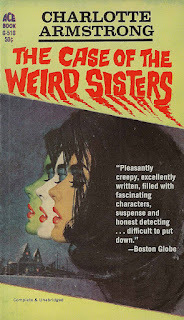 This book is a triumph for one huge reason: the characterization of the titular “weird sisters”. These women are all repulsive in their own unique way. Blind Gertrude is a vain woman who is proud of her accomplishments in that she needs no help to get about the house. Maud, who is deaf, is a lazy slob who is constantly eating candies and asking people to write their conversations down for her. One-armed Isabel seems the least objectionable of the bunch, trying to do things around the house, but she also seems to have a sneaky edge to her character and it doesn’t quite seem like she can be trusted. This is also one of the most uniquely-constructed “impossible crime” mysteries I’ve ever come across. 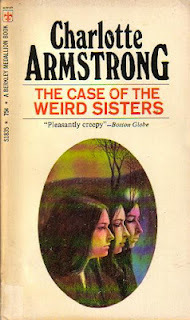 Armstrong’s strategy is brilliant: she gives us a series of accidents in which someone needed to use a specific sense that each of the sisters is lacking. To push the lamp over, someone needed to use their sense of hearing or sense of sight. To remove the detour sign, someone needed to use their eyes. To fiddle about with the gas, two arms were needed. But the sisters are secretive and would hardly be in a conspiracy together! Are the three working separately to achieve the same goal? Are they collaborating after all? Are any of the sisters lying about their disabilities? Enter MacDougal Duff, who solves the mystery in grand style, in a thrilling final scene that has several overtones of “weirdness” to it; there’s a mad quality about the finale that seems to emerge straight from a land of nightmares. It’s all quite brilliantly done. It’s only a shame that the author attempted to be too clever for her own good. Basically, Armstrong tries to overcomplicate one of the impossible crimes by having the killer go to extreme lengths to fool someone (say, Z). The problem is, this unnecessary bit of trickery wouldn’t work in real life: Z would have had enough experience to be able to recognize bla-bla-bla for what it was. It’s really a needless complication because not only does it delay the inevitable, it wouldn’t really work, and thus it seems like a rather silly (and slightly insane) thing for the killer to have done. Happily, this blemish doesn’t ruin the rest of the book, which is at a very high standard indeed. MacDougal Duff is an excellent amateur detective, and the logical deductions he makes are rather sound (if you can ignore that one piece of insanity from the killer). Still, a pervasive atmosphere of uncertainty floats through the entire book—you’re never quite certain what the killer will plot next, where the next strike will come from. The climactic scene, where the killer is revealed, is a brilliant one. And all this is such a roaring success because of the “weird sisters” and just how perfectly they are characterized. But where can you find this book? Have no fear, good friends, for this is yet another plug for the MysteriousPress.com! They have resurrected this book from out-of-print hell and have released itelectronically. I bought a Kindle edition and was most satisfied with the font and how clearly it was read. A bit more mistakes than usual have slipped into the text, but the editing is still at a good level. It’s comforting to see that in this uncertain age, where a digital book could easily contain the cryptic word “nhzqrx”. Overall, I recommend The Case of the Weird Sisters. Despite a piece of insanity from the killer that should never have fooled anyone, it’s a solidly-constructed “fair play” mystery with a touch of the sinister. 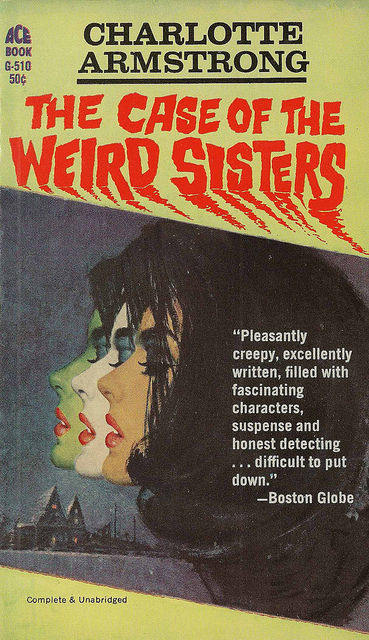 It’s greatest triumphs come in the form of the titular “weird sisters”, the detective MacDougal Duff, and a sinister atmosphere of unease. It feels like a traditional detective story as written by the great Margaret Millar. Transposed to Wales it was made into a pretty goodfilm with a script by Dylan Thomas. Sweet, it sounds like a classic mystery indeed. I really like how the sisters personalities gel with their physical disabilities. Thanks for the review. You have piqued my interest and jotted down the title. Interestingly, this title is not listed in Adey's locked room biography. TomCat, that doesn't surprise me, because this is hardly a conventional impossible crime. 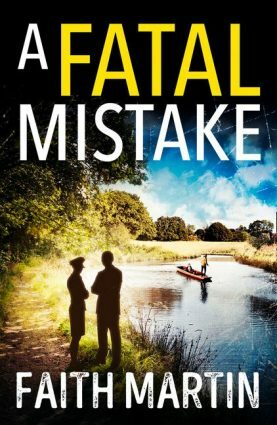 I didn't describe it in too much detail, but as the accidents get investigated, the possibilities are whittled down and it seems like a different sense was absolutely vital to each "accident". It opens up several possibilities, such as the idea that one of the sisters is faking her condition or the idea of a conspiracy-- the only thing really wrong with the solution is the bit of overcomplexity that doesn't do much for the story. You're welcome! If you get around to reading the book let me know what you think! Be sure to take a look at MP's catalogue-- they just yesterday released a lot of Clayton Rawsons, including some short stories that have been hell to find for me.